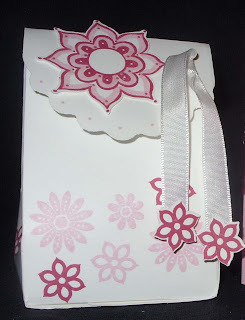 cornwall crafty stamper tutorials: One of a kind box tutorial. 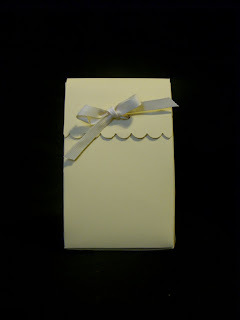 This box is made from one sheet of A4 card stock, even the decoration comes from the left over of the A4 sheet. 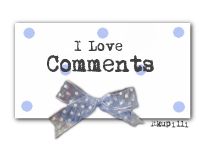 click the image to enlarge. Step 4. Cut away the area's shown and cut up to the 5cm score lines as shown in step 4 above. Step 5. If you want a curved lid shape the edges before you do steps 5 and 6 using your corner rounder remove the guard so you can use it to make a scallop edge, start in the middle and work your way out. Step 6. After you have punched your first scallop line your corner rounder up so you can see the corner of your previous scallop inside the cutting area ( you'll see it's slightly darker in the corner on picture 6), continue this around your lid until you are happy with the result. Step 8. 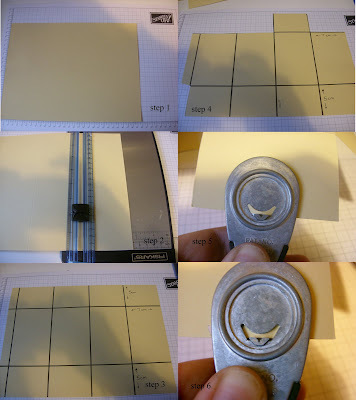 Using a hole punch make two holes in the lid then using a pencil mark the box and punch the holes so you can thread the ribbon through the box and lid to secure it. Step 9. With the left over card stock from the pattern make any decorations for the box that you need, for the one of a kind box i made a large flower and used the boho blossoms punch to cut out 4 smaller flowers to decorate the ends of the ribbon. I have also previously made a butterfly box in the same way with the Bold butterfly stamp set here. The size of your lid can be increased if you would prefer a longer flap by reducing the base flaps score line by 1cm to 1.5 cm and increasing the lid length by the same.